Hope Solo will appear on Dancing with the Stars and Billie Jean King will appear in a series of ads by the Arthritis Foundation endorsing exercise as a treatment for arthritis. 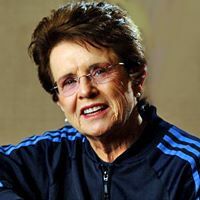 With both news items catching my eye this week, I couldn’t help but think that without Billie Jean King, Hope Solo probably wouldn’t be on DWTS. Ok, that sounds tenuous, but King was and is one of the most outspoken advocates for women’s sports. Without King (and maybe without that famous match she played with Bobby Riggs), maybe there wouldn’t be millions of girls and women playing sports. And if girls and women didn’t play sports, there wouldn’t be a Women’s World Cup, and if there weren’t a Women’s World Cup…well, you get it. There’s lots still to achieve in terms of gender equality in athletics, to be sure. In the meantime, DWTS may have increased its audience share with the recruitment of Hope Solo. Let’s not forget, though, that Billie Jean King had her own DWTS moment (ok, not exactly) back in 1968. King won Wimbledon that year (singles and women’s doubles). The cameras rolled when King danced with tennis great (and 1968 Wimbledon men’s singles winner) Rod Laver at a post-Wimbledon ball. A clip of that dance is available here. Great vintage footage! This entry was posted in Feminism and Culture, Feminism and Sports. Bookmark the permalink.